I wrote about Bird’s Instant Hot Crunch Pudding yesterday which reminded me of some of the great puddings and desserts that can be made by doing little more than “just adding hot water” (or possibly milk). Â I dare say many of you won’t even remember Hot Crunch, but let us see how it fares in the popularity stakes against some other classic easy to make desserts. What's your favourite 1980's packet mix pudding? Before I begin, the image accompanying this post is most definitely not a bowl of Bird’s Instant Hot Crunch Pudding, but it’s the closest I could find so it will have to do. Bird’s are best known for their instant custard powder (quite how a pink powder generates a yellow custard is a mystery to me!) but in the 1980’s they also made a wide range of other instant pudding mix products. Â They still make the lovely Angel Delight today, and of course Trifle mixes, but back then they also had a range of packet mousses (if memory serves me right) and also these hot puddings. The Hot Crunch Pudding came in a packet containing two sachets. 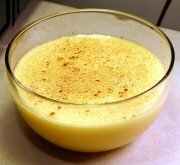 Â The first contained a powder which when mixed with hot water from the kettle became a gloopy custard like pudding. Â Once this was decanted into individual bowls the second sachet came into play. Â This contained a crunchy topping, a bit like biscuit crumbs or the top of an apple crumble, which could be sprinkled over the pudding to give it some added texture. 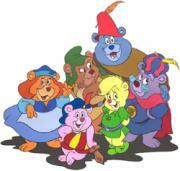 I read today that one of the hardest and most exciting games shows from the 1980’s is set to make a comeback. Â The Krypton FactorÂ was great fun to watch and a real test for the contestants as it stretched them most mentally and physically. Whether the new show will be as tough remains to be seen, but I certainly hope that today’s penchant for lowest common denominator television doesn’t tarnish the name of the show. Â So long as they don’t do a “Celebrity” version we’ll probably be OK. The original host of the show, Gordon Burns, will not be returning. Â Instead taking his place is Ben Shephard (pictured), one of the presenters on GMTV Today and host of the BBC’s Lottery tie-in show 1 vs. 100. Â The new show is apparently set to appear on our screens in January, so it won’t be long to see what the new version will be like. There aren’t many videogames that are based on normal everyday jobs, unless you happen to be a space marine of course. 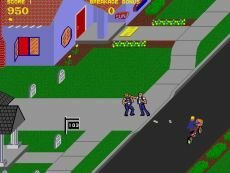 Â One of the few is was Atari’s 1984 hit Paperboy, where unsurprisingly it was your task to deliver newspapers to houses. The game had a clean fresh look that distinguished it from many other arcade games of the time, featuring a forced isometric 3D viewpoint with the game scrolling diagonally as you pedalled your bike along the road. Your job was to deliver copies of The Daily Sun to houses by throwing them to land in mailboxes or at the front door. Â The houses you had to deliver to were always drawn in bright colours, whilst the non-subscribers were very dark in colour, so it was easy to know which houses to deliver to, and which to try and vandalise my throwing papers at windows or garden ornaments. Â After reaching the end of the road you entered a BMX track where additional points could be earned by jumping gaps and throwing newspapers at targets. With Christmas Day being just a month away I thought it might be nice to give you some gift ideas for the 1980’s fan in your life (or even for yourself!). Â When writing your letter to Father Christmas then, why not consider the following items. Â You can even save yourself a bit of cash on the items from Firebox by clicking the banner in the right hand column of this very site, which will let you claim a free Â£5 money off voucher! TheÂ Michael Fish Fridge Magnet Set from Firebox allows you to recreate the old weather forecasts in all their glory in the comfort of your own kitchen. Â Little clouds, snow flakes and lightning bolts are included to give your fridge it’s own “cold front”. Sticking with Firebox we have the My Own Morph kit that lets you make your very own version of Morph. Apparently new recruits at Aardman Animation have to make a Morph as part of their induction, so why not get a head start if you fancy a job there? I wrote about this just the other day, but I really like the D&G Medicine Man Watch for its cool retro looks. Show it to kids these days and they’ll probably laugh at you when you explain test cards used to be shown when there were no programmes on TV! Available from Goldsmiths. Seven Again have a great range of 1980’s (and 1970’s for that matter) themed giftboxes in both male and female versions. Typical contents include a DVD of some relevant children’s TV, some sweets and a few little pocket money toys from the era. Which one feature from KITT would you most like in your car?